Two designers and home builder partners share their executions for pantries and butler kitchens. Designers and a builder present their ideas for creating a space to hang, store, and organize with style. Three builders offer their takes on porches as the vehicle for curb appeal, relaxing, and outdoor living. Three perspectives regarding how to treat entryways and focal points. 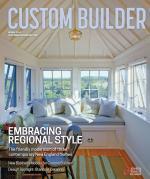 Front porch and Craftsman-style detail on a custom house built by Hartman Homes, Hudson, Wis.
A builder, designer, and an architect couple provide their perspectives about how built-ins can infuse creativity into a space. The master bedroom and deck look seaward through pocketing window walls. The bed frame is made of leather and Hawaiian koa wood (Photo: Pablo Mason Photography). Three award-winning architects and designers share how they use fireplaces to transform the look and feel of a room. Three award-winning architects and designers share how they transform water elements in and around the home into distinct custom looks.